Firefighters responded to 120 Forest St. Thursday morning and extinguished a house fire, saving two dogs in the process. Local firefighters extinguished a house fire at 120 Forest St. in Washington C.H. Thursday morning and in the process saved two dogs from the smoke-filled structure. 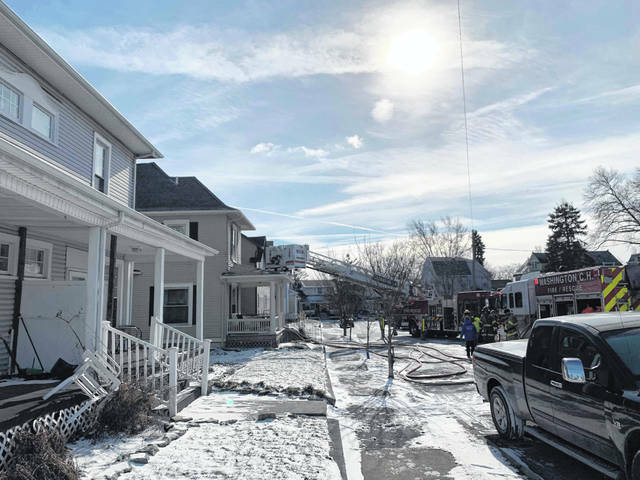 The Washington Fire Department received the alarm at 9:37 a.m. Thursday and arrived on scene to find heavy smoke showing from the first floor inside the residence, according to chief Tim Downing. No one was home at the time of the fire. Two dogs were rescued from inside, according to Downing, and were provided oxygen with assistance from the Fayette County Life Squad. “The dogs were fine and they were released to the owner,” Downing said. Fire coming from one of the side windows was knocked down and extinguished, and firefighters forced their way through the front door to extinguish the fire inside. No injuries were reported during the fire. The Bloomingburg Fire Department also responded to the first fire, and the Pic-A-Fay Fire Department covered the Washington C.H. station at that time. Shortly after the first fire, the Washington Fire Department responded to an attic fire at 542 Harrison St. The alarm dropped for the fire at 1:34 p.m. According to reports, the occupant of the home extinguished most of the fire with a fire extinguisher, and the firefighters then finished the job. https://www.recordherald.com/wp-content/uploads/sites/27/2019/01/web1_received_312527279397657.jpegFirefighters responded to 120 Forest St. Thursday morning and extinguished a house fire, saving two dogs in the process.